From the Thai border near the town of Chiang Saen you see two golden domes dominating the Laotian side of the Mekong River. If you cross the river you enter the Golden Triangle Special Economic Zone (SEZ). 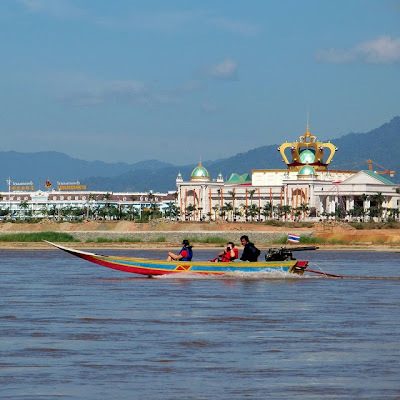 Welcome to the "Macau on the Mekong": The casino at Tonphueng in Bokeo province (see video on video 1 on youtube and video 2 on youtube) has been built by Chinese money and investors with links to Macau. Alongside the waterfront boats disgorge Lao and Thai businessmen, and gamblers. Beneath the Laotian immigration officers and some policemen you will meet a lot of Chinese people. The Casino has the Chinese name Jin Mu Mian (金木棉, "golden kapok"). The casino wants to attract visitors from countries, where casinos are forbidden: China and Thailand. What is a Special Economic zone in Laos gives not mainly work to Lao people. "Of the more than 4,500 people employed in the zone, only around 500 are Laotian", notes Tom Fawthrop in South China Morning Post. And he continues: "The investors who signed the contract to create the SEZ with the Laotian government back in April 2007 have pledged to change the image of the Golden Triangle, once the epicentre of the global heroin trade, into a tourist haven with glittering nightclubs, ecotourism and a new international airport. Yet despite the influx of cash and grandiose plans, there are plenty of concerns about the project, with a prominent Thai business leader and a UN agency worried that the centrepiece casino will be used to launder money from the region's infamous drug trade." And he adds: "And despite the scale of the multibillion-dollar project, the identity of the investors remains largely a mystery." The man who runs the operation in the name of the King Romans Group (KRG) is 60-year-old Zhao Wei(赵伟), chairman of the SEZ and KRG president (see Zhao Wei on youtube). He says he is vice-chairman of the Macau-Asean Business Association, but the journalist could not track this group down. Critics say that he is connected with the casinos of Mong La, in the Shan area of Myanmar, which many believe belong to the former drug baron Sai Leun, aka Lin Ming Xian (read asianews.it). Clear ist, that Zhao Wei has run a casino in Mongla, the Sin-City in Myanmar, situated opposite the town of Dalou in China's Yunnan province. Mong La in the 1990s established itself as a Chinese tourism hub for gambling, prostitution and transsexual cabaret shows - not to mention rampant money-laundering. 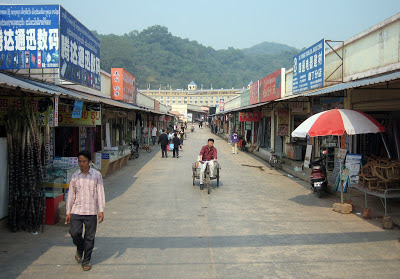 2005 Beijing, after reports of corrupt officials investing state funds on Myanmar gaming tables, banned Chinese officials and citizens from traveling to Mong La. The King Romans Group (Dok Ngiew Kham) is registered in Hong Kong. Its investors are said to be from Hong Kong, Macau and Yunnan Province. For the moment, there is the casino, a restaurant and a two storey hotel, designed to resemble Beijing’s Forbidden City, and a 30-kilometre road to the nearest town, the regional capital Ban Houei Xay. Later the complex should include a golf course, karaoke bars, massage parlours, a swimming pool, hotels, clinics and shopping centres (see promotion video on youtube. KRG also dreams about an international airport. The government of Laos has signed over 10,000 hectares to the King Romans Group on a 99-year lease, including Don Sao Island. According to Tom Fawthrop KRG plans to invest US$2.25 billion US by 2020 (the entire Laotian national budget in 2009 was estimated at US$1.13 billion). And Zhao Wei is planning a city of 200 000 residents at the end. This would be the second largest town of Laos after Vientiane. Crucial to the project is the Kunming -Bangkok Expressway. The China section is completed; the only major work remaining is the construction of a bridge spanning the Mekong and linking Laos and Thailand. The 4th Thai-Lao friendship bridge between Chiang Khong and Houay Xay is expected to be completed between late 2013. 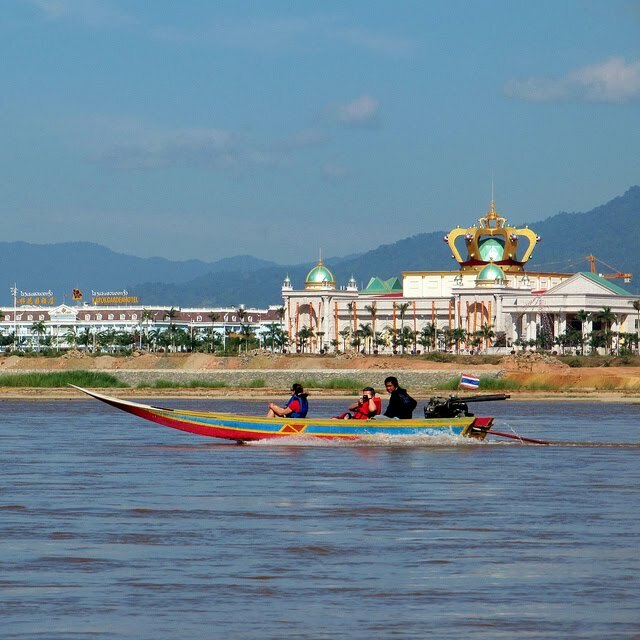 Some people fear, that Houay Xay could turn into the next Boten, a border town at the Lao-Chinese border, where Chinese traders and workers outnumber locals (read more on Chiang Rai Bulletin) and a Chinese casino had to be closed. The Golden Triangle Special Economic Zone (Homepage: laosez.com) lies "in the stomping grounds of one particularly powerful drug runner named Naw Kham", notes Lauren Hilgers. She writes: "Naw Kham is a Shan minority from the Burmese side of the border and a wanted man in Thailand, Burma, Laos, and China. His forces (called the “Hawngleuk militia”) exert control through Laos and northern Thailand. His speedboats are said to show up on the river and levy taxes on passing cargo boats, particularly the Chinese ones. In 2008, Naw Kham’s forces shot up a Chinese patrol boat. In April 2011, 34 crew members on three Chinese boats were briefly taken hostage by a group of pirates assumed to be answering to the drug lord. This past October, 13 Chinese were shot and killed while sitting in two small boats full of methamphetamine." Meanwhile Naw Kham has been arrested and waits in a prison in China for his trial. Lauren Hilgers adds: "Border casinos are attractive to Chinese investors for two reasons — they fill a huge demand for gambling and they facilitate the process of getting money out of the mainland." And then she writes: "Zhao insists his intentions in Laos are good. His goal, he says, is to be here for a long time. But it is hard to see how he will do it without at least reaching an agreement with local drug runners." Vice president of Kings Romans Group is Wenxin Zheng. He assured Lauren Hilgers "that there is no drinking or prostitution in the casino, but on the north side of the hotel I spot a shabby pink building with a row of dubious-looking massage parlors on the ground floor, and on the second level a bar whose windows have been blacked out by giant posters of pole-dancing ladies. A tall woman in short shorts stands outside one of the storefronts, sipping a Coke." If you are foreigner and visiting Thailand it is not so easy to go to the casino. You are now allowed to exit or enter Thailand at Sop Ruak and exit/enter Laos at the Golden Triangle Special Economic Zone. 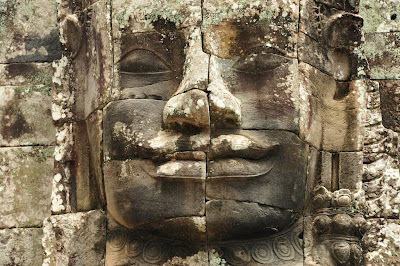 Here you need a Lao visum (30 days for 30 to 35 US-dollars. A chinatown market has been opened in August 2013 with 70 restaurants and shops. There are doubts, where the money for all the investments is coming from. Thai businessman Pattana Sittisombat, president of the Committee for the Economic Quadrangle, said: “I am absolutely concerned about the possibility that illicit funds could be attracted to this project, and that it could provide opportunities for money laundering.” (according to rfa.org). And there is another development: "Between Houay Xai and the Kings Romans casino, about 4,000 hectares of rice paddy fields have been transformed over the past two years into banana plantations", reports asia.nikkei.com. Chinese investors have leased the land from farmers. "The move has radically changed local lifestyles: the farmer-landlords earn 30,000-40,000 baht ($1,000 to $1,300) in rent per year, plus around 200 baht a day if they work on the banana plantations." Meanwhile Lao farmers are protesting against the Airport project of King Romans Group. The group originally wanted to take 236 hectares (583 acres) from 46 farmer families in six villages in return for compensation well below market value, but lately the developer announced plans to extend the area required for the project by an additional six hectares (15 acres), as rfa.org reports. The farmers on April 3 prevented King Romans officials from measuring out the new parcel of land under the protection of armed guards. The plans for the international airport project affect the villages of Phonehom, Donmoun, Phiengyam, Mokkachok, Khouan and Sibouheung. South China Morning Post Magazine travelled to the casino and found that an array of illegal wildlife products were being sold openly. "Slabs of rhino horn and pieces of ivory were available at stalls inside the entrance of the Blue Shield Casino. In the nearby shopping area, outlets were selling elephant skin and rhino horn for 200 yuan (HK$250) a gram. On a shabby farm masquerading as a zoo next to the Mekong River, 25 tigers and 28 bears were being kept in small cages", wrote South China Morning Post. Around King Roman Casino a new town with highrise buildings has been built, as you can see at the end of this video on youtube. In 2018 LianShing 聯盛 Group celebrated the opening of a Vip room in Blue Shield Casino. Little, landlocked Laos: Pawn or pivot in Asia’s future? I think that special economic zone provides significant benefits to the country.